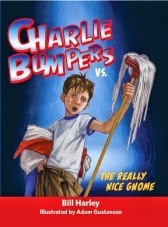 We've never read Charlie Bumpers, but my son enjoys books with humorous moments, so it sounds like something he would like. I think they would like all of the imagination in it! The adventures Charlie Bumpers has. My son loves books like this! We would love to try the series out. I think my nephew Gio would like the illustrations. He has a creative mind and likes art. My son really likes gnomes, so I think he'll love this! I think my nephew would love the action in it. I think he would like the adventures Charlie gets into. My grandkids would love these humorous books! I think that my kids need to read about Charlie as a way to set an example of not being able to always get what they want. Not sure if they would love that aspect of the story but I would. My daughter would love any part that makes her laugh. She loves silly stories. They look like very appealing for boys to read. My son would love that he is a boy like him and that he has fun adventures!